IHBC Director Seán O’Reilly said: ‘As our summary listing of recent posts below demonstrates, new advertisements posted by employers on the IHBC Jobs etc service continue to highlight the need for a truly diverse range of conservation-related skills among new staff’. ‘Regular posts continue to cover the more familiar public sector conservation adviser roles, such as Leicester’s search for a conservation officer. Also in demand are the more tightly specified skills sets sought by Historic England, for example, in their posts for Inspector and Assistant Inspector of Historic Buildings and Areas. As well as more regulatory roles, prominent in modern job profiles are regeneration-linked project and management responsibilities, seen in the Heritage Action Zone Project Manager post, and in the Isle of Man’s heritage project manager role – open till 31 August. 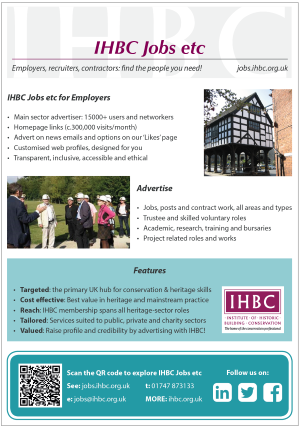 This last employer is looking for a ‘highly motivated construction professional with a background in building conservation to join our small but busy Properties Management Division to deliver a range of projects’, which is why it specifically cites IHBC membership, even if it does not require IHBC accreditation. 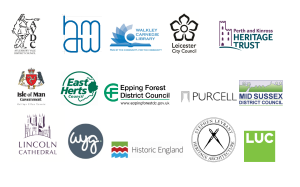 At the same time the demand for architects and specific heritage design skills also remains high, with posts at HMDW, Walkley, East Herts, and Stephen Levrant’s.